Milan maybe one of the top fashion cities in the world but there is much more to see in this trendy, urban metropolis – it is also home to an incredible patrimony of art and culture which includes one of Leonardo Da Vinci’s greatest masterpieces: the Last Supper. Guarantee your visit to see one of the most famous works of art in the world, Leonardo da Vinci's 'The Last Supper'. Reservations to see this legendary painting are limited and sell out quickly, sometimes months in advance. Choose this best-selling tour and be guaranteed advance booking and skip the line tickets. Plus you'll take a half-day tour of the impressive city of Milan. Leonardo da Vinci's masterpiece, The Last Supper is housed at Santa Maria delle Grazie in Milan and has earned a spot in the UNESCO World Heritage List. The delicate nature of this mural and its importance means that Last Supper tickets are strictly limited to those who have pre-booked. This Skip the Line Tour of the Best of Milan includes this difficult to obtain pre-booked entrance, guaranteeing exclusive no line entry and an intimate viewing of the Last Supper. But there is plenty more to Milan than Leonardo's masterpiece! Your half-day sightseeing tour of Milan also includes a walking tour, introducing you to Italy’s most stylish city. Stop by the alluring Galleria Vittorio Emanuele II shopping gallery, a 19th century glass vaulted shopping arcade. Brimming with fashionable shops and cafes, it is often called the ‘salotto di Milano’ or ‘Milan’s drawing room’ for its importance over the years as a common meeting point for the people of Milan. Visit the medieval Sforza Castle. A grand medieval Castle and fortress, the Sforzesco was once seat and residence for the ruling family of Milan and now houses several of the city's museums and art collections. 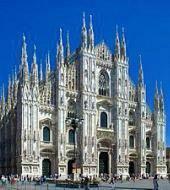 Next, tour the splendid Duomo, one of the world's largest, most striking Gothic cathedrals. Some 135 spires and 3,200 statues are crammed onto the roof and facade of the building. Finally, visit Milan’s most famous Opera House, the fabulous La Scala theatre. Founded in 1778 and still in use, some of the world’s greatest musicians and opera singers have performed here including Pavarotti and Giuseppe Verdi, whose famous operas such as Falstaff often premiered in this very theatre. Your entrance ticket provides 24 hour admission to the theatre and museum so you can return the next day. Tour of the Museum and Teatro alla Scala. Walking tour through Galleria Vittorio Emanuele II and visit of the Duomo. 12.30: Entrance to Leonardo da Vinci's "Last Supper"
Additional languages are available: Spanish (Tuesday and Friday); German (Wednesday and Saturday); Portuguese (Thursday); Italian (Sunday). - Proper clothing required to enter religious sites. - Visit to the "Last Supper" guaranteed; visit to Duomo and La Scala prohibited in case of special events.